VANCOUVER, WA--(Marketwire - June 4, 2007) - Nautilus, Inc. (NYSE: NLS) -- Bowflex®, North America's favorite home exercise brand, has introduced a new upright version of its space-age Bowflex Revolution® model -- the Bowflex Revolution XP Home Gym. The Revolution XP gym features the company's new patented Spiraflex® linear strength technology in a space-saving upright design with articulating arms that achieves more than 90 exercise movements. The compact unit fits a 4x5 foot space or corner, making it perfect for lofts, condominiums or any home. "This new home gym design is perfect for the millions of North American families who want high-quality fitness workouts in the privacy of their home but do not want to commit much floor space," said Tim Hawkins, President of Fitness Equipment for Nautilus, Inc.
"By combining the popular linear resistance featured on Bowflex Revolution gyms with an upright design, we have opened the door for millions more families to include the benefits of strength training in their daily routine. We believe this new model will further expand linear strength training, which already achieved in its first full year of sales what it took Power Rod® technology 11 years to achieve." The upright-style Bowflex Revolution XP home gym uses the same Power Pak® technology as the original Bowflex Revolution introduced more than a year ago, but requires less than half the floor space and can be positioned in a corner. "I have been a fan of the original Bowflex Revolution but the only challenge to recommending it was space considerations for many people," said Gregory Florez, CEO of the Salt Lake City-based fitness services provider First Fitness, Inc. "The Bowflex Revolution XP offers the comfort, safety and effectiveness of the original Revolution model but without the space limitations." With the addition of this new home exercise gym, the company's three newest home fitness products introduced this year can fit comfortably in less than 50 square feet, about half the size of a small bedroom. They include: the Bowflex Revolution XP home gym, Bowflex TreadClimber® 6000 cardio trainer, and Bowflex 1090 SelectTech® Dumbbells and stand. The new lineup is in keeping with the company's plans to provide innovative fitness options even for areas where space is limited. 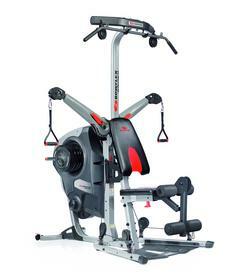 In late 2005 the company introduced Bowflex Revolution home gyms with Power Pak technology. These gyms offer linear resistance through lightweight power packs that create resistance from rubber straps that coil around a shaft. This technology was first used on the International Space Station to help astronauts maintain muscle and bone mass while in microgravity environments. The company's original Bowflex products were introduced in 1986 using Power Rod technology that provides progressive resistance. The Bowflex Revolution XP home gym comes standard with 220 pounds of Power Pak resistance, squat harness, workout poster, instructional DVD, and literature about the new Bowflex Owner's Club. It features a 10-year limited warranty and the company's famous six-week satisfaction guarantee. The unit retails for $2,299 plus $199 shipping and handling, or as low as $35 per month through Nautilus card financing. Upgrades include an additional 80 pounds of resistance, lat tower, ab back pad and accessory rack. Some assembly and 7-foot ceiling clearance is required. Headquartered in Vancouver, Wash., Nautilus, Inc. (NYSE: NLS) is a pure fitness company that provides tools and education necessary to help people achieve a fit and healthy lifestyle. With a brand portfolio that includes Nautilus®, Bowflex®, Schwinn® Fitness, StairMaster®, and Pearl iZUMi®, Nautilus manufactures and markets a complete line of innovative health and fitness products through direct, commercial, retail, specialty and international channels. The Company was formed in 1986 and had sales of $680 million in 2006. It has 1,500 employees and operations in Washington, Oregon, Colorado, Oklahoma, Illinois, Virginia, Canada, Switzerland, Germany, United Kingdom, Italy, China, and other locations around the world. More information is at www.nautilusinc.com. About this company Nautilus, Inc.